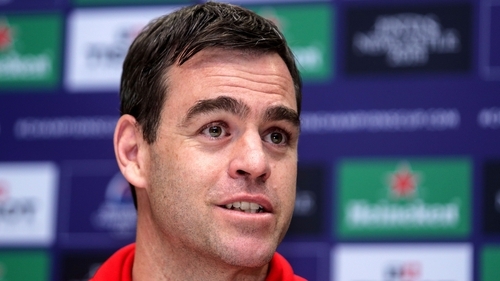 Munster coach Johann van Graan says the club is on the look-out for new coaching staff for next season. The South African signed an extension, which runs until 2022, to his contract last week. Van Graan left his role as Springboks forwards coach in November 2017 to succeed Rassie Erasmus after his compatriot took over the national side. The 39-year-old's impact was immediate as he and the coaching staff of Jerry Flannery, Felix Jones and JP Ferreira guided the squad to the semi-final stages of the Heineken Champions Cup and Guinness Pro14 last season. Ahead of Munster’s European semi-final clash with Saracens on Saturday, Van Graan revealed that he hopes to add to his backroom staff. "In terms of the coaching staff we’re really enjoying it and that will be the next step in our decision-making," he told RTÉ Sport’s Michael Corcoran. "We’ll have a review after the season and then move forward next year. "Hopefully we can keep everyone involved and maybe look at bringing in some additional faces and some new blood with some new ideas but that’s all for next season, our only focus is on this week." Munster were beaten semi-finalists in the last two seasons, crashing out meekly to Saracens in 2017, when Erasmus was in charge, and Racing 92 last year in an equally disappointing fashion. Van Graan, however, says the defeat in France this time last year won’t impact on this weekend’s clash against the Premiership champions. "It’s difficult to say," he said. "Last season we travelled to South Africa [for Pro14 games], this season we gave some of the guys the week off so there’s no way to know. "What I can say is that we’ve worked really hard for the last 41 weeks. "Hopefully we can deliver and we’ve put ourselves in a position to get into a final by getting to a semi-final. "It’s a one-off. If we win everyone will say we’ve learned our lesson [from last year] and if we lose then you don’t." Follow Munster v Exeter (kick-off 5.30pm, Saturday) & Leinster v Toulouse (3.15pm, Sunday) via our live blog on RTÉ.ie/sport and the News Now app. Listen to live national radio commentary of Leinster v Toulouse on RTÉ Radio 1's Sunday Sport.